A large turnout of members and guests gathered to celebrate the highlight of the year for Middlesex St Andrew’s Lodge, No. 8897, Burns Night. The meeting was held on 25th January 2019, the 260th anniversary of the birth of the Bard of Ayrshire, Robert “Rabbie” Burns. Middlesex St Andrew’s Lodge was founded in 1979 by workers from the McVities biscuits factory in Harlesden, many of whom came from Scotland for work and who were already Masons. They established their own Lodge in Middlesex and encouraged fellow workers and Scots to join them, building a Lodge that to this day prides itself on its approach of enjoying its Masonry – ‘we have no airs and graces’, as Secretary W. Bro. Graham Hope succinctly puts it. The hors d’ouvres of the day’s business was conducted in the Temple, with an Official Visit comprising a delegation led by their APGM, W. Bro. Nigel Codron SGD, being received in time to witness the presentation of Grand Lodge Certificates to Bros. Shane Gordon and Paul Doe. Bro. Gordon travels from Aberdeen to attend the Lodge, into which he had been introduced by his step father-in-law. The Certificates were presented by W. Bro. Hamilton McAdam, the Lodge’s Chaplain. Then it was on to the serious business, with the Festive Board starting at 7.30 pm and concluding at a gut-and-liver-busting 10.30pm. Central to the proceedings was W. Bro. Alastair Stewart, who not only piped in the haggis but also delivered the address to a haggis and the Immortal Memory, which is the toast to Burns and his life that delivered at the first Burns night in 1802. Further highlights followed in the form of poems ‘To a Mouse’ and ‘To a Louse’ recited by W. Bro. Brian Welsh and W. Bro. Graham Hope respectively. ‘The Lodge owes a great deal of thanks to Alastair Stewart, who was in great demand and could easily have commanded substantial sums officiating at other Burns nights’ ceremonies’ said Graham Hope, ‘as he regularly reminds us’. 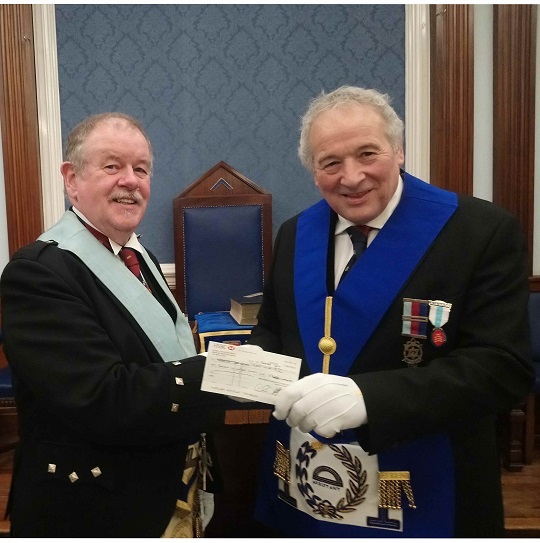 The Lodge also presented a cheque to W. Bro John Briggs ProvGChStwd for £1,400 for The 2020 Festival, taking them to Patron status which is a great achievement for a lodge with 15 members. 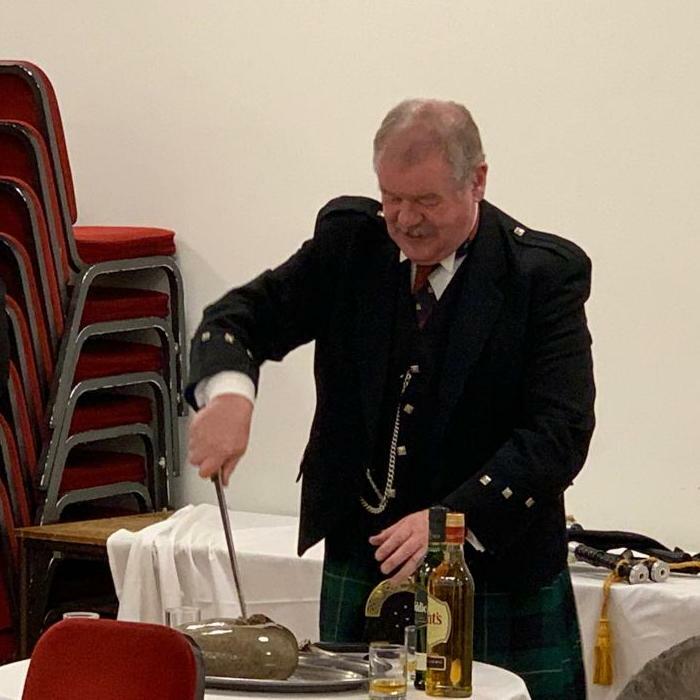 The traditional Burns supper of Haggis, neeps and tatties was preceded by Arbroath smokies, sourced by the Lodge from Arbroath and which added to an evening that was greatly enjoyed by the Brethren and their guests.